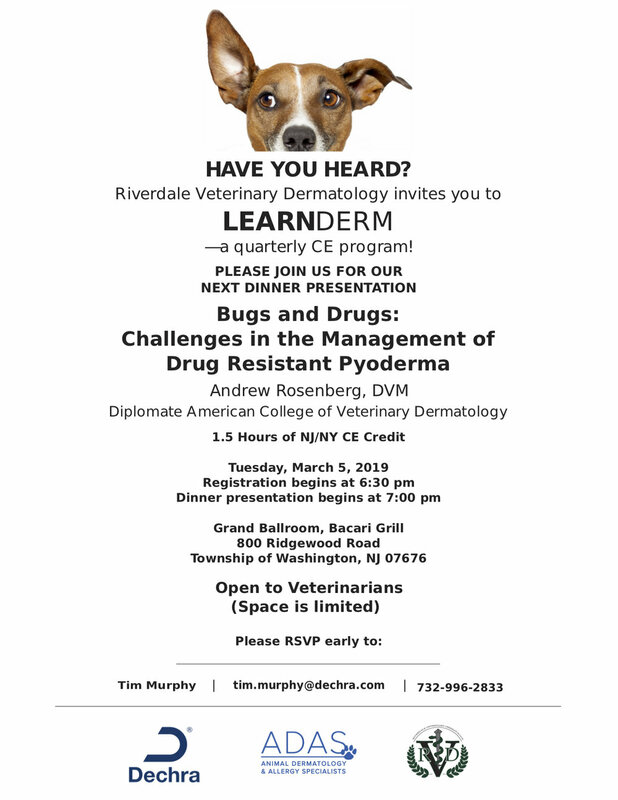 Next Learn Derm Event is Tuesday March 5th - Let's Talk Bugs and Drugs and How to Treat Resistant Bacteria! This presentation will focus on an emerging threat - drug resistant bacteria that affect the skin of dogs and cats. Different treatment options and recommendations will be presented. The importance of determining and managing underlying causes will be discussed. Dr. Rosenberg lectured to primary vets about Dermatology Emergencies at the NY Vet conference on Friday November 8th at the Javits Center in New York City. As the seasons change, so might your dog’s grooming needs. 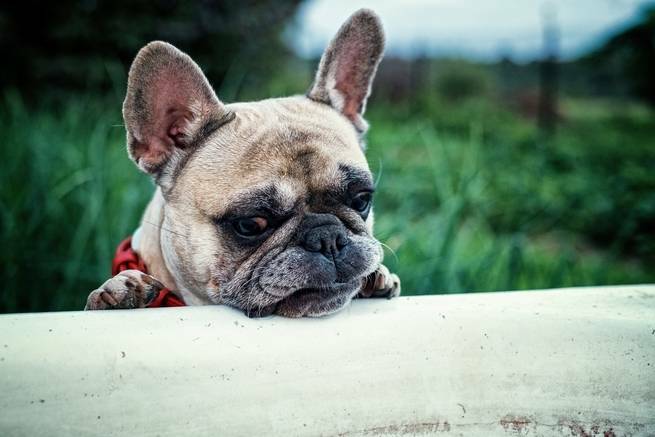 It’s important to take care of your pooch’s fur, skin, paws and nails year round, and cooler temperatures bring about some special considerations. Next LearnDerm event Wednesday, November 28th - Let's Talk Cats and Derm Pearls! This case based presentation will introduce a series of common but challenging feline skin diseases with a focus on developing a list of differential diagnoses and indicated diagnostic tests. Results, treatment plan, follow up and a discussion of each condition will then be reviewed. The lecture will conclude with practical tips (not limited by species) for general practitioners to apply everyday in their approach to management of patients with otic and dermatologic conditions. Dr. Rosenberg and Dr. Budgin attended the North American Veterinary Dermatology Forum in Maui this past April. They attended many lectures as well as the Diplomate Dinner for all boarded dermatologists. Was a great week spent in Maui with lots of sunshine! Dr.Rosenberg and Dr. Budgin had a great turnout Wednesday May 23rd at their lecture at the West Milford Township library! Thank you to Greenwood Lake Animal Hospital for hosting and organizing this great event! Here are some notes and photos from the evening. 1) Raw and grain free diets are NOT good for your pets. 2) Coconut oil does NOT heal pet dermatological issues. 3) You CANNOT blood test for food or other allergies. 4) Flea and tick preventatives MUST be used year-round. 5) Bathing IS good for your itchy pet once a week with the right shampoo. 6) Online pharmacies are UNRELIABLE sources for purchasing medication. Manufacturers do not sell directly to online pharmacies. 7) Licking paws IS a sign of allergies. (Pets lick their paws because they cannot scratch paws). 8) Steroids used short term are GOOD when appropriately administered by your Veterinarian. Your dog gets allergies for the same reasons you do is a new article by Lexi Krupp that features Dr. Rosenberg. 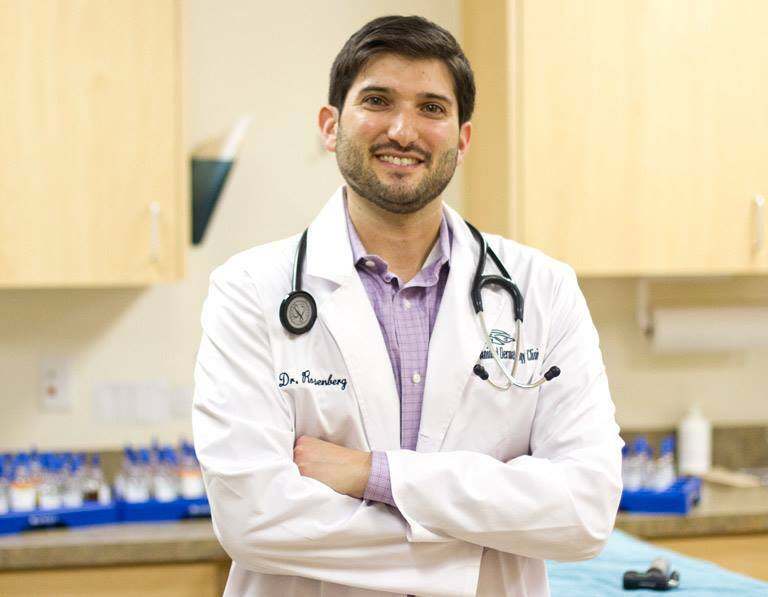 Dr. Budgin becomes Fear Free Certified! The Fear Free initiative promotes considerate approach and gentle control techniques used in calming environments. Utilization of Fear Free methods and protocols leads to reduction of fear, stress and anxiety triggers creating an experience that is more comforting and rewarding for all involved including pets, their caretakers and veterinary health care teams. To become certified, veterinarians and veterinary staff are required to complete a comprehensive, 8-part educational course and exam. They also have to take continuing education to remain certified. Our next LearnDerm event is around the corner! Looking forward to seeing you there! For more information on this exciting new series please contact our office. 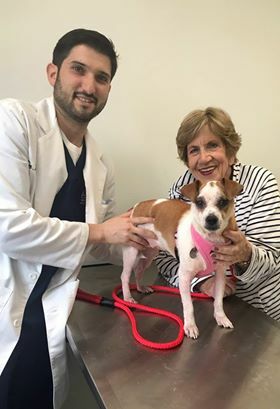 We're excited to share that Dr. Rosenberg will be broadcast on the radio discussing allergies on Dr. Barry Lissman's weekly radio show, "Ask the Vet." The show will air this Sunday at 7AM on Walk 97.5 FM, Shark 94.3 FM, K98.3 FM (at 6AM), Max 103.1 FM, and WHLI 1100 AM. While most of the stations are broadcast on Long Island, Max 103.1 can be heard in many parts of NJ. The show will also be livestreamed @ walk.tunegenie.com. Tune in for a great discussion on allergies in pets. Dr. Budgin speaks on different allergens and treatments.